Black Bean Brownies - Gluten Free! Black Bean Brownies - Gluten Free! Dark chocolate flourless, naturally sweetened Black Bean Brownies – a healthy gluten-free dessert recipe! You’d never know these are made with beans! I kid you not, these brownies are made with black beans. When I first heard whisperings about the mystical brownie made with black beans, I thought for sure they had to include other ingredients to make the whole thing come together, but for reals: these brownies are completely flour-less! PLUS, I took the recipe a step further to include coconut sugar instead of cane sugar, making these sweet treats naturally sweetened and lower on the glycemic index than regular brownies. Meaning, this is a dessert that won’t spike your blood sugar. I know…it sounds too good to be true. I’ve been enjoying these lumps of lovejoy while writing the intro for my cookbook, Delicious Probiotic Drinks. They’re great for keeping me alert and energized without giving me a sugar crash. Brain food brownies? I think so! You’re probably wondering how black beans could possibly make for a decadent dessert. Put your faith in the bean. I promise you, these things are like magic. The brownies taste nothing like black beans – they really just taste like brownies! They’re gluten free and come out with dense, velvety texture. Addicting…that’s what they are. What’s that you say? You want to eat these for breakfast? No one’s stopping you, as the way I see it, these fiber and protein-filled naturally sweetened treats are healthy for you! Black Bean Brownies are sister to the Garbanzo Bean Brownies I posted back in December. Both are as easy as throwing the ingredients in a blender and flipping the switch. I repeat: these brownies are made in a blender. AH-mazing! 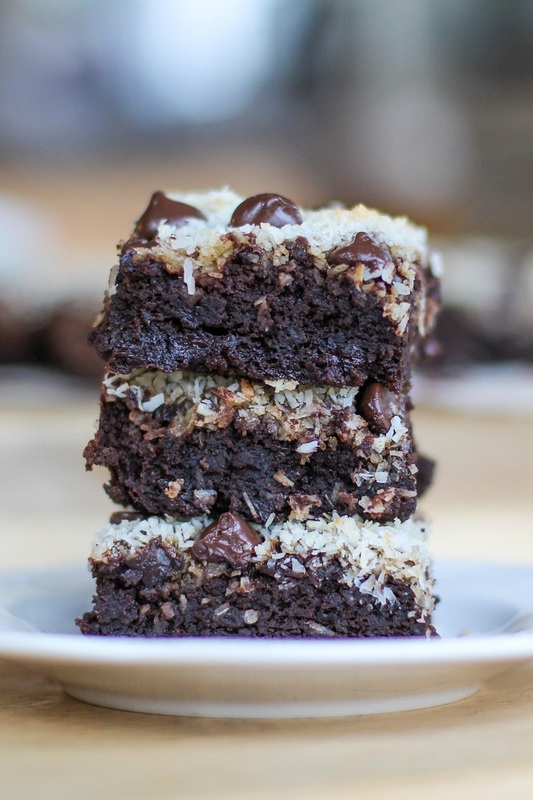 You can do as I do – load them with raw cacao powder , dark chocolate chips and shredded coconut. You can also add fresh raspberries, or simply leave the batter as is…and spoon-feed it to yourself for breakfast. At some point in this post, I’m going to tell you to put balsamic vinegar in your brownies. And that would be right now. Fear not: balsamic vinegar adds richness and takes the place of salt in the recipe. Plus when the vinegar hits the baking soda, it fizzes (not as much as your volcano project in grade school, much to my dismay, but enough-so to have a wow factor). Be dazzled! Black bean blender brownies. They’re a revelation! Preheat the oven to 350 degrees F. Line an 8" x 8" baking pan with parchment paper, then lightly oil the parchment paper. Add all of the ingredients to a blender except for the chocolate chips and blend until smooth. Stir ½ cup of the chocolate chips into the batter and pour into a lightly oiled or parchment lined baking dish. Sprinkle the shredded coconut on top of the batter. Sprinkle the other ½ cup of chocolate chips on top. Bake for 18 to 20 minutes until brownies are set up and a toothpick tests clean. Allow brownies to cool 15 minutes before cutting into them. Your sense of humour is amazing my friend:-) And the recipe is so unique..a fizzy brownie! Love that! I am drooling looking at the pictures..they look out of this world! I’m a major fan of black bean brownies. Yours look absolutely beautiful and delicious! I killed my brand new food processor trying to make a batch, so I’m glad yours tells me to use a blender 🙂 No fear about throwing in some vinegar — The vinegar + baking soda combo can be used to replace eggs, so I’ve been known to throw some white/apple cidar vinegar in once in a while, never balsamic though — sounds tasty! I haven’t tried vinegar and baking soda mix yet. I’m glad I found that out now. 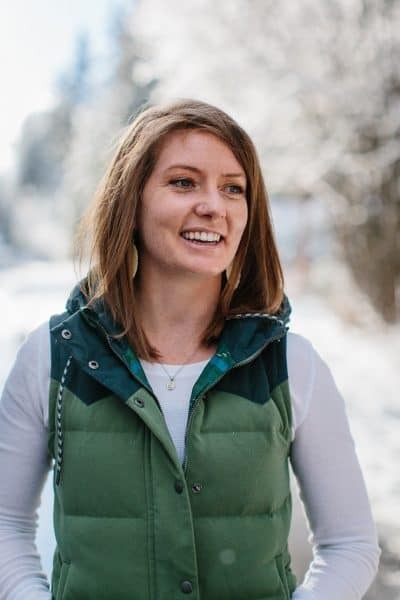 Thank you for sharing Kelly! There are not enough superlatives to tell you how much I love this recipe! I made it exactly like the recipe except used espresso powder instead of coffee grounds because I bought some to make homemade magic shell (per America’s Test Kitchen it increases the chocolate flavor). I am tempted not to tell the person I made them for what they are made of, but I will just in case her kids have allergies. I bet no one will be able to tell. And thanks to Kelly for the tip on the vinegar baking soda combo! I didn’t know that. Yum!!! Putting bean in you brownies is so smart! I love your to-do list here, even if I haven’t done a large majority of the things listed. I’ve never read The Alchemist or watched SharkTank. I also hate squats. (I try to get around these by running and doing other exercises… but I always end up doing them again because they are necessary. Even if they are mean.) AND to top it all off, I’ve never made Black Bean Brownies. Just pinned this recipe, and I’ll certainly be making them in the near future. Your description of them is fabulous, and I think they are certainly worth trying! I totally agree with Alexis- these look like the best! I am totally a fan of black bean brownies, but these look nothing like a healthy brownie. 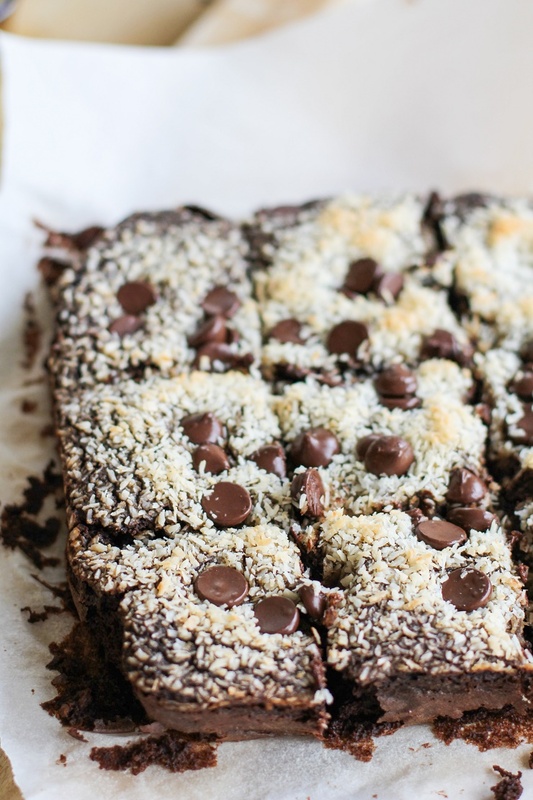 The chocolate chips and coconut… smitten! And seriously interested to try the balsamic vinegar addition! I think I should re- read Alchemist…good advice. Girl, these black bean! brownies…they look unbelievably good…I have to try it as soon as possible!!! ahh the Alchemist!!! Such.A.Good.Book. I can just see myself curling up with a good book and a few of these tasty treats!! I love your to do list! I need to read The Alchemist, it’s been on my “to do” list for years. These brownies are off the hook my friend! love all those crazy ingredients! GIRL! My trainer makes me do SO MANY squats and lunges, I don’t even try to keep count because I can’t count that high. Although when it comes to necessary evils, my real hatred is the kettle bell swing. OH GEEZ. Here, let’s squat and then swing this big heavy weight and, oh yeah, try not to kill yourself or any innocent passers-by. I absolutely love (!!!!) The Alchemist. I have recommended and given it away several times as well. Such a good book! And these brownies look incredibly delicious! what size pan do you use to bake them in?? A 9 x 9 sqaure pan 😉 I’ll add mention of that to the recipe 🙂 Let me know how they turn out! I love that this is gluten free and looks so delicious. I have included this in my Kosher Cooking roundup today. I never, ever, ever, ever would have thought to put black beans in my brownies. That’s why I need you…Julia you are so full of cleverness! OMG, the black bean brownies are probably the best brownies i’ve ever had: perfect moisture content, deep fudgy flavor. i will definitely be making them again, if only to have people eat them and then drop the ‘bean’ ball to their astonishment. seriously, if you’re skeptical of this recipe, you.will.be.astonished! before every bite, i kept thinking, “ok, NOW i’m finally going to taste the black bean,” and yet never even a hint of it! my mom was curious about how it would turn out, and i more than happily have recommended it to her. Jamie, I’m so glad you enjoyed the brownies! I think they’re the best brownies I have ever made and the only thing that is missing from them is that crackle top you get from wheat flour brownies. The flavor and texture makes up for lack of crackle top, though and I think all brownie lovers should try this recipe. Let me know if your mom ends up trying them and thanks so much for the feedback!! Yum! These look so good 🙂 I love the use of coconut on top for some added flavour. I’ll be making these for my kids! I’m wondering about the coffee grinds…. instant coffee? Or real coffee grinds? I’ve never added grinds to a recipe before. Hi Parise, I used real coffee grinds, but instant coffee grinds would yield more flavor if you have them on hand. Thanks for stopping by! Great thanks Julia! I’ll try them this weekend! 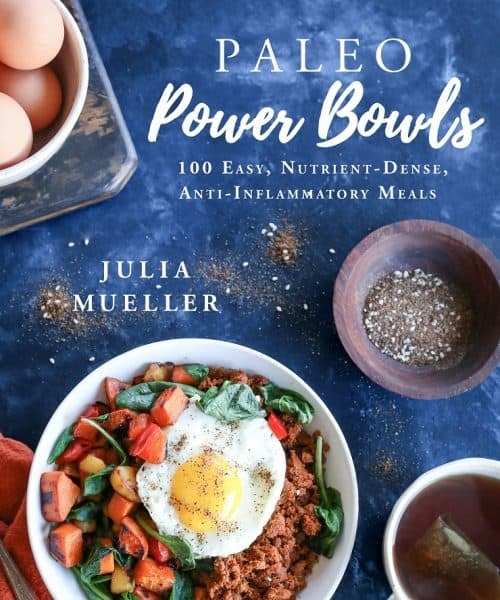 I just made these healthy little morsels – mine came out looking just as delicious as your pic – and they taste incredible! However- mine are sort of fragile and crumbly and stuck to the parchment- any ideas what I could have done to prevent this ?? Were they just as fragile even after they had set up for a few hours or a day? Usually mine are crumbly just out of the oven and after they sit a while, they hold together pretty well. As weird as it sounds, I would suggest lightly oiling the parchment paper. Sounds a little over-kill, but I’ve done this and it definitely helps. SO glad you made the brownies and thanks so much for letting me know how they turned out! Sarah! I’m so happy you enjoyed them! These are the go-to brownie in my house. My bf’s mom makes them all the time – she was the one who introduced them to me – I love how rich and soft they turn out and you’d never know there was a black bean in sight. Good luck with your GF quest. As long as you’re willing to get creative, it’s actually not all that difficult. 🙂 Thanks so much for letting me know you tried the brownies! Awww Erika, you’re too kind! I’m glad you like the recipe. It’s definitely a big favorite in my house and also very adaptable. I think it’d be fun to add some raspberries or do a peanut butter version. Hope you have a fun weekend!! Anyway, I poured the batter into a pan and then dolloped 2 tablespoons of peanut butter and about 1 tablespoon of jam over the top of half of the brownies and kind of swirled it in. Hmmm. I’d love to see your experiments! I will definitely be experimenting more to see if the trouble was on my end (very possible!)! I’d think the same about the half teaspoon of coconut oil…I added it plus the coconut milk simply for moisture and it seemed to work for me. I’d have to try the recipe without the chocolate chips and with the peanut butter and jam in order to know what happened. I’ll let ya know when I figure it out 😉 Thanks a bunch for the feedback! Is it ok if I use apple cider vinegar instead? I haven’t tried apple cider vinegar yet, but I’m sure you can. You can also leave the vinegar out altogether 🙂 Hope you enjoy! Never one to leave a recipe alone (I consider a recipe a mere suggestion :)), I added a bit more coconut oil, some vanilla, a pinch of salt, and some strong coffee. I cut the coconut sugar a bit. I put the chocolate chips – maybe 1/3 cup, or so (didn’t measure) in the blender with the other ingredients, but left a few chunks. I didn’t add chocolate chips on top. I stuck with the coconut on top, but before adding it to the top of the brownies, I mixed in some lucuma, cinnamon, and a dash of garam masala because I had a hankering for a bit of spice. They were moist, exotic-tasting, and super yummy! Thanks! LOL, Kim, I’m the same way…I have a hard time following a recipe to the T. Your changes sound great! You’re making me want to make another batch! These are amazing…i just made them to take to a friend’s BBQ – they are moist….chocolately (not even a word but don’t know how else to say it!) ….seriously yummy! I am not gluten free but am always looking for a healthier way to make sweet treats and this scores a 10/10! My Gluten free friends will love them! Thanks for the recipe! Hi! Great Recipe! My entire family was pleasantly surprised with the flavor! There are (seamingly) No beans present in this bean brownie! Decadent and delicious are befitting descriptions! We even added some vegan marshmellows on top in tge last 10mins of baking (then turned on the broiler for abt 1 min to give them a nice light toast like a smore) Thanks for sharing with the world! I made these today while stuck inside during a snow storm. They taste pretty good but they didn’t stay together. Fell apart easily. I had to cook them a lot longer than the recommended time too. Maybe a few more minutes would have helped. Any suggestions? Also where the beans suppose to be pureed? Mine ended up slightly chunky. I made these abt 3-4 times in the past 6mos-the family loves them! (Once I forgot to add a sweetener though!) Anywho-Joey We toss all ingredients in our Ninja & they come out fine.So yeah-I think blender/food processor might help w/ the falling apart thing. I’ve had to bake them a bit longer too though. I will try them again in my Vitamix. I used a regular hand mixer this time. I also used regular sugar bc I didn’t have coconut sugar on hand. Hi Joey, in re-reading the recipe instructions, I realized how people could be confused, so I modified them to be more clear. Yup, you use a blender to blend everything together! The brownies will still be a little crumbly (more so than regular brownies), but probably way less crumbly than you experienced on your first batch. I’m so glad you’re going to try these again! They truly are magnificent, and I love that they’re flour-less, too! Definitely provides for a low-guilt treat 😉 Thanks so much for your interest and let me know how you like them if you make another batch! Just made these in my Vitamix. They are delicious! We made brownie sundaes with them. I didn’t tell anyone what they were made of until after they ate:) I didn’t have coconut, but still turned out great. These are incredible!!! Super moist and perfect flavor. I added only about half the coconut sugar and thought they turned out just right. I can see adding more sugar if I were sharing with others that prefer their desserts on the sweeter end. But I think I’ll keep this first batch all to myself ;). Thanks so much for sharing this wonderful recipe! 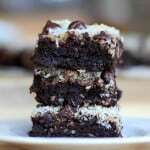 I think this is by far the best black bean brownie recipe I have ever found. I have made several times and tweaked slightly. I make a 1 lb bag of dried beans and use 1/3 and freeze the rest for later batches. I increase sugar to 1 cup and eliminate coconut water, coconut, and chocolate chips. I put chopped pecans on top, instead. Most importantly, I added 3 teaspoons of vanilla and 1/2 teaspoon of salt which really enhances the flavor, especially if using dried beans. Thanks for developing such and amazing recipe! It has the texture of the most decadent brownie. Thank you so much for sharing! These were absolutely amazing!! My whole family loved it too! After reading a few comments I added 1/4 tsp salt and 1 tsp vanilla and increased the coconut oil to 1 tbsp, and it turned out perfect. Wahooo! So glad you and your family enjoyed the brownies and that the recipe changes worked out! Thanks a million for your feedback, Emma! do you think these could be made in a larger pan? say 9×13? or would the recipe need to be doubled? I haven’t tried the recipe with cooked dry beans, but I have heard other people have had issues with making bean brownies using the dry beans. So glad you like the brownies – did you end up trying the recipe with canned beans? Do you have the nutritional info for these brownies? They are sooooo delish! Hi Colleen, I’m so glad you like the brownies! I don’t calculate nutrition facts for my recipes, but I know there are websites where you can plug in the recipe info to get nutrition facts. If you’re just looking for calories, I have heard myfitnesspal is a good resource 🙂 Hope that helps! Happy New Year! I’m dying to try these, but we can’t have eggs. I’m tempted to try the recipe with an egg replacer (starch combo). Any thoughts? Get some coconut palm sugar, sometimes called coconut sugar or palm sugar – You’ll be a convert. It’s low on the glycemic Index, high on the flavor meter, with minerals and micronutrients to boot. Unrefined honey has a GI that’s even slightly lower than coconut sugar, but some brands are highly processed, losing most of their health benefits along the way, and raising their GIs. Some have sucrose added, or worse. Fast food chains and others are adding the dreaded high fructose corn syrup to honey, so check carefully when you buy it. if you buy honey at a farmers market, a health food store or a food coop, it’s likely real honey with all the benefits, but less than 25% of “honey” sold at supermarkets is actually what it says it is. These came out scrumptious! I’ve tried about four other black bean brownie recipes, and this one is my favorite now. I left them in the oven a few minutes less than recommended for extra gooeyness. I ended up devouring the whole pan by myself in two days! Made these today and they are almost gone. Seriously the best healthier brownies I’ve ever made. I’m always on the hunt for sweets. I accidently left out the coconut oil (distracted by a 4 year old) and they still turned out amazing!!!!! Thank you for the recipe.